ALUCA GmbH is located in southern Germany in Rosengarten nearby Schwäbisch Hall. Founded in 1994 ALUCA is a pioneer in van racking systems made of 100% aluminum. 3 subsidiaries in Germany, 20 authorized Dealers, 20 salesmen in the field. Customers are energy suppliers, public services, mechanics and craftsmen. ALUCA has a distribution network in central Europe and grows continouesly. A huge range of shelves, drawers to make a Transporter a mobile Workshop or a mobile stock. ALUCA produces in aluminium to reduce the weight of racking systems and to increase the payload. Less weight means more payload for tools and spareparts for mobile services. The products are extremely robust and sturdy. There are two product lines : 1. 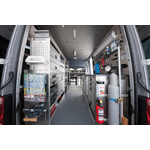 System ALUCA - shelves and drawers for all Kind of service vans. 2. ALUCA dimension2 : a System for small and midsize vans based on big subfloor drawers. 1. Customers with high Standards and quality reequirments for their mobile service.